1ST BDE - A battalion of the 25th Inf Div's 1st Bde smashed a night assault on its position Dec. 19 by two reinforced VC battalions in savage hand to hand fighting that left 40 of the enemy dead. Manchus of the 4th Bn, 9th Inf, that afternoon had conducted an air assault into the area, about 5 kms south of the Bde's base camp at Katum, as part of Operation Yellowstone. Except for a few mortar rounds that came in as the battalion consolidated, the landing zone was cold. Soon after being inserted, the Manchus were joined by elements of the 7th Bn, 11th Arty, lifted in by Chinook (CH-47) to support coming operations. At dusk though, the peace was shattered as the Viet Cong began a mortar attack that intensified as the night wore on. Shortly after midnight, they launched a furious barrage that sent more than 200 82mm rounds into the U.S. perimeter in less then 20 minutes, but failed to injure any of the well dug-in Manchus. As the shells were still bursting on the American position a half hour later the Viet Cong launched their ground attack from all sides. "They sent their men in under their own mortars," a battalion spokesman said. "We found VC who had been hit with their own rounds out there." The only success the enemy was to enjoy during the night, came on this initial assault as they blew up the artillery's ammunition dump. Against the fiery background of exploding 105mm shells U.S. Infantrymen fought a savage swirling battle with an enemy they reported to be acting somewhat confused. Largely responsible for the Viet Cong's fatal uncertainty was the way the Manchus were dug in. Instead of ringing the artillery with a single line of troops, the Manchus had drawn one company around the guns. Outside this circle they established a series of strong points manned by the rest of the battalion. "The Viet Cong thought they were up against the typical one dimensional perimeter," the spokesman said. "But when they got inside what they thought was the perimeter they found themselves surrounded by GIs." Typical of the action was the story related about one soldier who attacked a fleeing Viet Cong with his empty M-16, battered the guerrilla to the ground and killed him with a blast of his own AK-47. Another trio of Manchu troopers watched as five of the enemy began to set up a machine gun, then wiped out the position with a blast from a claymore. The battalion suffered only five killed and 12 wounded. For each casualty the enemy paid a heavy price. At dawn the badly battered enemy broke contact. In addition to the enemy bodies, a search of the battlefield revealed 15 AK-47 Russian assault rifles; an RPG launcher, one RPG-7 round and two RPG-2 rounds; four Russian assault machine guns, two bangalore torpedoes; a heavy machine gun of unknown make; 25 CHICOM homemade grenades; 1000 rounds of AK-47 ammunition, and 500 rounds of machine gun ammunition. 2ND BDE - An 18-year-old Chieu Hoi who became "fed up" with the communists shortly after they drafted him from his native village has proved himself valuable to a 25th Div platoon. According to 2LT Joel Wilkerson, platoon leader with Delta Co, 2nd Bn, 27th Inf "Wolfhounds," the Hoi Chanh has saved his men from numerous booby traps. In a recent sweep near the Oriental River 48 kms northwest of Saigon, Vo Van Siem led the platoon to 10 enemy sampans submerged along the river bank. "He told us he became fed up with the VC shortly after they took him from his village," Wilkerson said, "so he gave up in September." Since then, the teenager has fought and lived with the Wolfhounds on many operations throughout Hau Nghia Province. If you forgot to celebrate New Year's Eve this year, you're due for another chance over the two-day period of Jan. 31 and Feb. 1. This period is known as Tet in Vietnam, and heralds in the Year of the Monkey. More than just the beginning of a new year, it corresponds to America's Christmas, New Year, Easter, and the Fourth of July combined. It's a family reunion, a spring festival, a national holiday and everyone's birthday. 2ND BDE - A raiding party of U.S. and South Vietnamese troops killed three armed Viet Cong providing rear security for a communist leader's meeting recently in Hau Nghia Province, 43 kms northwest of Saigon. Acting on information that a group of Viet Cong and North Vietnamese advisors were conducting a planning conference, members of the Combined Reconnaissance and Intelligence Platoon (CRIP) made a helicopter assault into the area. CRIP is composed of men from the 25th Inf Div's 2nd Bn, 27th Inf "Wolfhounds" reconnaissance platoon and South Vietnamese troops from the Hau Nghia Province intelligence platoon. 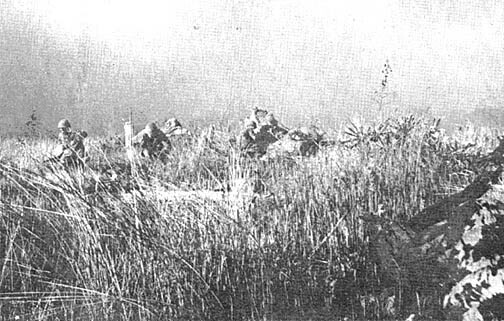 Spotting a group of VC soon after they landed, the platoon split into two groups and gave chase towards dense woods in which the enemy force hoped to escape. One CRIP element encountered stiff resistance when they assaulted a security position on the treeline. The other element caught three enemy in the open, gunning them down. 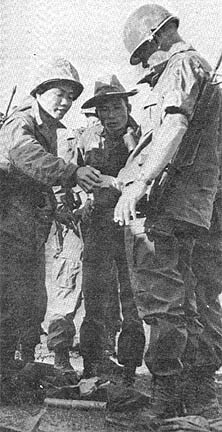 ARVN casualties were light and two Americans were wounded in the exchange. "They were the best VC fighters I've ever seen," said 1LT Christopher Straub, CRIP's American platoon leader. "They were well-armed, well-equipped and even had regular boots. "One man, whom we think was a squad leader, had a little booklet of American phrases, presumably in case he captured an American," Straub added. CRIP members recovered two Chinese AK-47 assault rifles after the battle, but the communist leaders managed to escape. 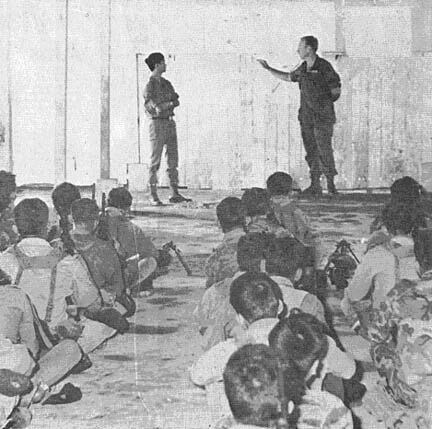 SAIGON (MACV) - A new warning regarding the penalties for transporting weapons while on R&R was given U.S. servicemen today by a MACV spokesman. Current directives prohibit carrying or transporting weapons of any type aboard R&R aircraft. A few members of the U.S. Armed Forces have violated these regulations, the spokesman said. Customs officials at the various R&R sites, particularly those of the British Commonwealth at Hong Kong, Singapore and Sydney, are thorough in their inspections. Those who attempt to enter these countries with weapons and are apprehended face severe penalties under the laws of the host R&R nations as well as possible disciplinary action for violation of U.S. military directives, the spokesman said. All American servicemen planning R&R trips are urged to follow one basic rule regarding weapons. Leave them with the unit, he said. SAIGON (MACV) - Three states, Connecticut, Louisiana and Illinois have voted bonuses in connection with the Vietnam war. The awards, covering active duty personnel, discharged veterans and surviving next-of-kin, range up to $1000. In 1965 Illinois authorized payment of $100 to residents with active duty tours on or after Jan. 1, 1961, and who earned the Vietnamese Service Medal. A serviceman must also prove that he resided in Illinois during the year preceding his entrance on active duty. Next-of-kin (spouse, children, parents, brothers and sisters in that order) may collect $1000 if the deceased dies of Vietnam service-connected causes even if the serviceman had received the $100 bonus prior to his death. Claim forms are available from the Illinois Veterans Commission, 221 W. Jefferson St., Springfield, Ill. 62705. The deadline is July 1, 1970. 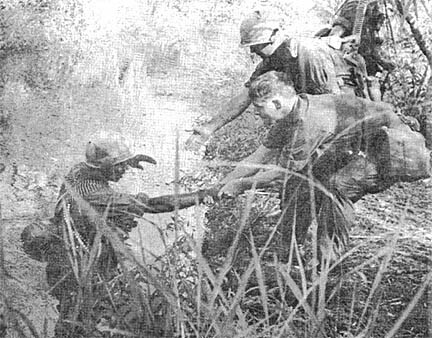 Louisiana passed a bill granting a $250 bonus to state residents who served in the Vietnam combat area between July 1, 1958, and the end of the Vietnam campaign. However no payments will be made until the hostilities terminate. The Louisiana bill contains a survivors' benefit payment of $1000 to unremarried widows, children under 18 and parents of servicemen (in order of eligibility) who are Vietnam casualties provided the deceased was a qualified resident of the state prior to his entry into the armed forces. Claim forms may be acquired from the Louisiana Department of Veterans Affairs, Vietnam Bonus Division, Old State Capitol, Baton Rouge, La. 70801. Military service anywhere in the world since Jan. 1, 1964, will earn Connecticut residents a $10 bonus for each month of active duty, with a $300 ceiling. To collect while on active duty the serviceman must have at least 30 months of credited service while honorably discharged veterans may collect whatever bonus is due them since the established base date with a 90-day minimum. The minimum residence requirement for eligibility is one year before entry into service. Next-of-kin may receive the survivors' bonus if the deceased died as a direct result of the performance of military duty. Grandchildren and parents must have been living in the state one year prior to apply for the benefit. In the event the serviceman was unmarried his parents receive the bonus. Survivors of honorably discharged veterans will be paid in accordance with the span of countable service. The maximum benefit to surviving next-of-kin is $300. Claim forms are available from the Office of the Treasurer, Vietnam Bonus Division, 15 Lewis St., Hartford, Conn. 06115. The deadline for filing is three years after the end of the war. Secretary of Defense Robert S. McNamara has announced a program in which the Services will assist civilian police agencies in bringing their forces up to strength. Under it, servicemen who receive a firm employment or training offer from a legally constituted City, County, State, or Federal government law enforcement agency can be released up to 90 days earlier than their scheduled separation date. This program will offer servicemen about to be released from active duty the opportunity to aid their communities in their fight against crime as members of local police forces. The program is being implemented at the request of President Johnson in an effort to help fill some 15,000 vacancies in police agencies throughout the nation. Officials of police agencies will be permitted to interview and examine prospective candidates at military installations, but a serviceman can also make direct arrangements with any qualified police agency of his choice. Although the program was initially aimed at strengthening major metropolitan cities' police forces, provisions have been made to include every legally constituted public police agency in the nation. No early release dates will be made to those who desire private police employment. If you are interested in serving on a particular force such as the one in your hometown, you should either write a letter or send a special form obtainable from your personnel section to the police agency where you are seeking employment, requesting additional employment information. As a part of applying for employment as a police officer you will probably be asked to complete a detailed application form, to take a written examination, to undergo a physical examination, and to participate in a personal interview with police officials. Your Service is prepared to assist in this processing by providing physical examination facilities and written test facilities as a minimum. Once you have received a firm offer of employment or notice of training, you should contact your personnel officer who will assist you in your application for early separation. However, you cannot apply more than 180 days before your scheduled date of separation, although you can make inquiries to police departments at any time. Remember, you must make application for early release, and have a firm offer of employment by an authorized police agency. You must also have been counseled concerning fraudulent separation. 1. You will be released at least 10 days prior to a specific reporting date for employment or training. 2. You will be released as soon as administratively feasible if you are offered immediate employment or training. All applications will be processed through channels to be established by the Services. SAIGON (MACV) - Far Eastern areas currently requiring passports and visas for U.S. servicemen traveling outside the Republic of Vietnam were recently listed by a MACV headquarters spokesman. The spokesman said subordinate commands have been requested to assist individuals by citing specific passport and visa requirements on orders granting leave, temporary duty or permanent change of station outside Vietnam. The action came as a result of an increase of border violations by improperly documented persons departing Vietnam by military and MAC contract aircraft. Passports and visas are obtained by U.S. Armed Forces members at the U.S. Embassy at Saigon. (1) Military arriving in civilian clothes must notify British Embassy one week in advance. (2) (Pertains to Kuala Lumpur and Penang also.) No visa required for stay of less than three months. (3) Visa applications go to the American Embassy, Saigon, and Consular Section issues a letter of introduction to Philippine Embassy, where visa is placed on this letter. Concurrent visa for Manila and Clark will not be issued. No visa required for transients at Clark who stay less than 72 hours. Military with valid Manila visas may travel on military aircraft stopping enroute to Manila providing they do not get off at Clark. (4) Military on leave arriving and departing on R&R flights are not required to have a passport or visa. (5) Military assigned to Military Assistance Program mission require passport and visa. Military TDY or PCS for MAAG require passport. All visitors not leaving airport are exempt from visa requirement. (6) Cholera immunization must be within four months but not less than six days prior to RVN departure. WASHINGTON (ANF) - U.S. Army personnel and their families are reminded that the Immigration and Nationality Act requires all aliens in the United States to report their addresses to the Attorney General during the month of January. The Act provides serious penalties for willful failure to submit this report. Compliance with the requirement is, therefore, of the utmost importance to aliens in the Armed Forces and to their relatives who may not be citizens but are residents of this country as of Jan. 1, 1968. Members of Veterans of Foreign Wars Post 855, of Bethlehem, Pa., have undertaken a project to promote "Mail From Home" for members of the Armed Forces. A brief description of the individual and his interests should also be included. "Mail From Home" is similar to a project undertaken by Wilbur F.H. Raidline during the Korean War. Working alone, his efforts generated 35,000 letters and 560 packages for Americans serving in Korea. Raidline is now commander of the Bethlehem Post. DAU TIENG - "Don't jerk the trigger, squeeze it," admonished the sergeant as the young trainee looked at him bewilderedly. The sergeant, realizing that the man didn't understand a word he had said, laid down beside him on the gravely dirt road that is the firing line and with a few words, more gestures and several strained facial expressions, he seemed to make himself understood. The next shot was squeezed off and the bullet flew true to the homemade targets set up in the abandoned pineapple field. "Number one," said the GI. "Number one" - which was accompanied by a pat on the back of the willing student. The language barrier is but one of the problems faced by the twelve U.S. Army soldiers of the 3rd Bde, 25th Inf Div, who are training the men of the 51st ARVN Ranger Bn at the village of Loung Hoa, 24 kms west of Saigon. The training team, headed by MAJ Donald Oura of Maui, Hawaii, consists of men who volunteered from different units of the 3rd Bde. The refreshed training spans a ten day period and covers basic infantry techniques such as marksmanship, patrolling and tactics. Bright and early on the first day of training, 2LT Howard Renker of Ansonia, Conn., begins with instruction in basic marksmanship. Through one of the four interpreters with the team, Renker explains and demonstrates the firing positions, the trigger squeeze and the sight picture to the Ranger company. In the large village square, the Vietnamese troops then spread out and the practical exercise begins. 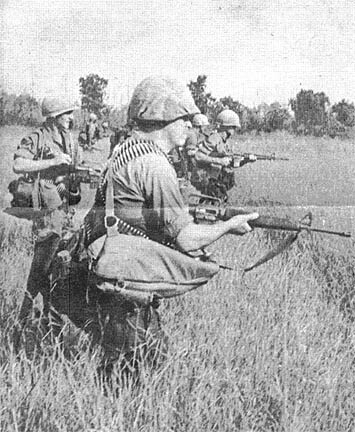 "Because of the variety of weapons the Vietnamese Army uses," commented Renker, "we have to teach the basics and then specialize in each of the individual weapons such as the M-1 carbine, the M-1 rifle and the BAR." After the dry firing exercises, the class moves to the improvised rifle range which the team set up outside the perimeter of the village in the pineapple fields which blanket the area. 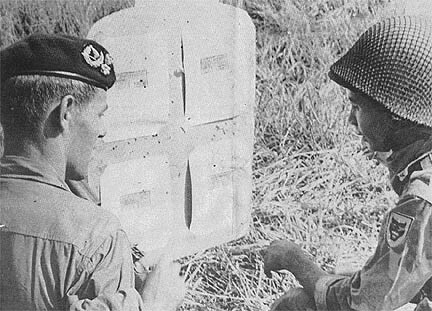 Using targets made from C-ration boxes, the weapons are zeroed (sights aligned by firing) and the positions learned in dry firing are put into practical use. The firing line is an old blown out road which was repaired by Vietnamese engineers before it could be used. Following the three days of marksmanship training, the Rangers move on to tactics. River crossings, patrols, ambushes and tactical problems which could turn into enemy contact are all a part of the course. A rope strung between two trees along the bank of the Oriental River serves as the stream crossing training aid, while three sampans rented from the local villagers serve to move the entire company of troops across the river during the water-borne operation. "Everytime we have the river crossing, I am scared," relates 1LT Kenneth Price of San Francisco. "With only the three sampans, we are vulnerable to a VC ambush from the other side of the river. So far though, everything has gone smoothly." The head of the Tactics Committee, Price thinks the Rangers are good troops. "They compare favorably with a lot of American units I've seen. They have a world of experience when it comes to fighting in this country since most of them have been fighting for most of their lives." Living away from their parent unit, the training team has developed tastes for some of the native Vietnamese food sold in the village. SFC James Terril of Houston, Tex,. is the cook for the men, and squid has been tried and not too unfavorably accepted. The men live in the nunnery of the huge Catholic Church which is the center of the village. Each morning they are awakened by the bell calling the people of the village to worship at 5:30 a.m. The priest, who is also the Elder in the village, allows the men to rent the nunnery, which hasn't housed sisters of the Church for years. "This has been a rewarding experience for me," commented Price. "We hope that the training gives them a thirst for learning and that they will continue to improve." THE RANGERS MOVE OUT ON A TACTICAL PROBLEM THROUGH THE TALL ELEPHANT GRASS SURROUNDING THE VILLAGE. CLASSROOM INSTRUCTION IS ALSO GIVEN THE RANGERS BEFORE LIVE FIRING BEGINS. LARRY AUGSBURGER OF PHOENIX, ARIZ., CHECKS THE SHOT GROUP OF A RANGER ON THE RIFLE RANGE. THE COACH AND PUPIL METHOD OF RIFLE MARKSMANSHIP INSTRUCTION IS USED ON THE RANGE. DIV ARTY - The fire power of the 3rd Bn, 13th Arty, recently came to the aid of the "Wolfhounds" during a heavy firefight 13 kms northwest of Cu Chi. 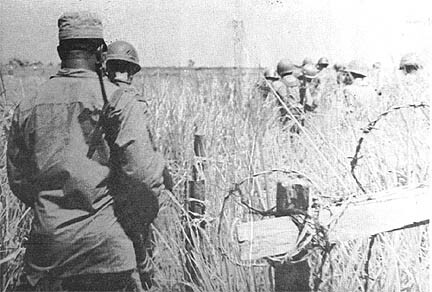 The battle resulted in 10 Viet Cong killed and a two detained. It all started when the 1st Bn, 27th Inf, received heavy small arms and automatic weapons fire from a woodline while on a search and destroy mission. The infantrymen pulled back and called for artillery support to saturate the area. The fire mission went to B Btry of "The Clan," and within minutes the 155mm self-propelled howitzers were sending shells into the enemy positions from their gun pads at Cu Chi. "The battery started firing at 9:15 a.m.," according to 1LT Richard M. Mazur, the battery commander. "All six howitzers were firing and the battery area was soon wreathed in smoke as a total of 312 rounds were expended," said Mazur, of Stamford, Conn.
Mazur, who was commanding from the fire direction center during the contact mission, described the events leading to the capture of the POW. "We fired salvos totaling one hundred rounds into this area," explained Mazur as he pointed to a map, "when we received a check-fire from the Forward Observer." Over the radio the FO, informed the cannoneers that a dazed Communist soldier had emerged from the shell-pocked woods with his hands raised. After the prisoner was secured and removed from the area the bombardment continued. With the enemy forces neutralized, the artillery was "walked" in front of the advancing infantry. Several times the artillery was called on to destroy bunkers and Bravo Btry responded with pinpoint accuracy, destroying a total of four enemy bunkers and two hootches. EASY NOW - Members of a Recon Pit from the 2nd Bn, 14th Inf, cross a stream during an operation in War Zone C.
1ST BDE - What do you do with 12,000 empty beer bottles your unit accumulates every month? Until recently this novel problem confronted the Philippine Civic Action Group, Vietnam (PHILCAGV), based at Tay Ninh. Each month a brewery in the Philippines donates several hundred cases of beer and each month, PHILCAGV found itself wondering what to do with the empties. "We couldn't just throw them out on the dump," a spokesman explained "because we knew that the Viet Cong would be sending them back to us in the form of boobytraps. Breaking each bottle would be too time consuming." Finally a member of the group's civic action section devised a solution - teach the Vietnamese to make the bottles into something they can use. 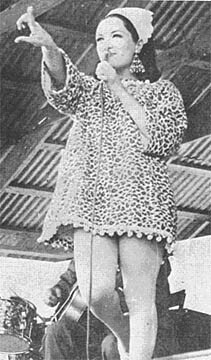 Taking a loop of thin wire, the Filipinos showed the people in the hamlets near Tay Ninh how to heat the strand over an ordinary fire and then drop the loop over the bottle's neck. Place the bottle in cold water and the top drops off easily, fashioning a highly useful glass. "The idea's been accepted in every hamlet we've visited," the PHILCAGV spokesman said, "The process has the added virtue of being very versatile; if you're not too handy with the wire and fail to make a glass, you can always make a container out of the rest of the bottle. And at last resort, you'll always be left with at least an ashtray." DAU TIENG - MAJ Jack Johnson recently assumed command of the 188th Aslt Hel Co. He succeeds LTC James H. McWhorter of Mount Prospect, Ill. Speaking to his men in front of the "Black Widow" headquarters, McWhorter praised the men he had commanded for the past six months. "You have come a long way since we left the United States," he commented. The new commanding officer, Johnson, a native of Des Moines, Iowa, served as the safety officer with the 269th Avn Bn before coming to Dau Tieng. "I can only ask," said Johnson, "that you men continue for me with the highest loyalty and honor that you have shown in the past six months." 1ST BDE - A point man for "Charlie" Co, 4th Bn, 9th Inf, recently received a lesson in trailsmanship from another expert on walking the point - the scout dog attached to his unit. For four hours, the Manchus had been cursing and hacking their way through the dense HoBo Woods. PFC Robert White of Buffalo, N.Y., normally the "point" for the 1st Plt, was moving about 25 meters behind a big German Shepherd and his handler. "We had just gone down into a ravine" White recalled, "and as the dog got to the opposite side he stopped, looked up the slope and sat down. I figured he was getting balky, so I walked up to take' the lead. As I passed him, he looked at me and growled." About halfway up the hill White stumbled and reached out instinctively for something to cling to. He grabbed a stalk of bamboo and suddenly there was a loud 'pop' and the trail began to fill with thick white smoke. White had tripped a VC boobytrap, but luckily the grenade he'd triggered was a dud. DIV ARTY - Too many for a forward observer party; too few for an infantry platoon, but the recon section of B Btry, 1st Bn, 8th Arty, definitely travels the thickets. Commanded by 1LT James D. Montavon of Bedford, Ind., Bravo Btry's executive officer, the recon section is made up of those who are not crewmen on the howitzers. To perform their mission they must leave the sanctuary of the six 105mm howitzer emplacements and scout the area from the perimeter of the fire support base outwards. While on a patrol Montavon commented, "If we travel two or three grid squares we see the ground laden with shrapnel from our howitzers." 2ND BDE - American marksmanship and an enemy's misfortune put a sergeant's dog tags back around his neck after he lost them in the Iron Triangle, 48 kms northwest of Saigon. SSG Henry Wadahara of Los Angeles, loaned his C-ration can opener, suspended on his dog tags chain, to a buddy just before they moved to a new base camp during the 25th Div's Operation Atlanta. As they sat down for lunch, the 1st Bn, 27th Inf "Wolfhound," discovered his friend had left chain, dog tags and opener behind at the abandoned camp. When the battalion finally returned to Cu Chi, Wadahara asked for new tags. Instead, the Alpha Co clerk handed him his old ones. "They just came down from division," the clerk explained. "Someone out in the Triangle killed a VC who was wearing them." 1ST BDE - A Viet Cong brigade will have to go on a crash diet thanks to Alpha Co, 4th Bn, 9th Inf. On the second day of Operation Yellowstone, the company was conducting a search and destroy mission about 7 kms south of the Cambodian border deep within War Zone C.
SP4 Steven A. Gray of Portalees, N.M., spotted the glint of the sun bouncing off a tin roof about fifty meters ahead of the element he was with. He and his platoon leader, 2LT Richard D. Tipton of Springfield, Ohio, moved up with three other men to investigate. The party found a typical Vietnamese hootch measuring about 20 by 40 by 7 feet that had one distinctive feature - it had been built without windows or doors. Curious, the men pried off the roof and found the interior filled to the rafters with rice; 560 cubic feet of it weighing some 140 tons. Returning to the area the following day, they discovered two more similar hootches filled with rice, 30 meters from the first. This find brought the total weight of the rice uncovered to 440 tons. 2ND BDE - A 25th Inf Div scout dog saved his master's life twice in the course of one fight, when he first alerted him of an impending Viet Cong ambush, then warned him of an approaching enemy in the fight that ensued. Members of the 1st Bn, 27th Inf "Wolfhounds," further credited the scout dog with enabling them to kill eight communists in a fierce one and one-half hour battle. The action took place recently during the 2nd Bde's Operation Atlanta in the Iron Triangle. The Wolfhounds had been following a trail when the dog, "Charlie Brown," alerted. SP4 Patrick Mitchell of Ozone, N.Y., a member of the 38th Scout Dog Plt, warned the men behind him something was in the treeline to their front. The patrol continued on, growing more cautious as Charlie Brown continued to alert, Mitchell said. Then the lead elements ran into an enemy force which opened fire from bunkers and tunnels. "When the VC first opened up on us," Mitchell recalled, "Charlie Brown and I were pinned down right on the trail. Then we had enough fire going so we could maneuver, and I moved off the trail into some brush. "I had to hold Charlie Brown to keep him down. He's been wounded before and gets scared in a firefight. "As I was holding on to him, he alerted in the direction I'd set up my sector of fire. I looked closely and saw a bush moving about 30 meters away." Mitchell sprayed the sector with automatic weapons fire, hitting the hidden enemy. After the battle, the Wolfhounds found four bodies in the immediate sector, and four more scattered over the battlefield. "If we hadn't expected to find some VC up ahead after Charlie Brown alerted," Mitchell said "we might have been in trouble." "On top of that, he let me know that VC were coming just before he got in hand grenade range, so he saved us twice during that fight." 1ST BDE - An infantryman's buddies are often his most important asset. But as one 25th Div trooper discovered recently there are times when you could do without them. 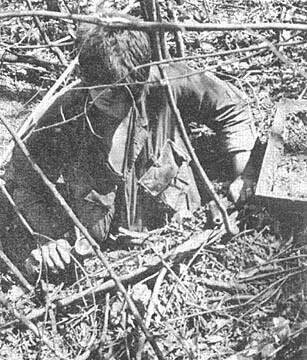 On a sweep southeast of Tay Ninh with Alpha Co, 4th Bn, 9th Inf, PFC Mack Skeens came upon an anti-tank mine. 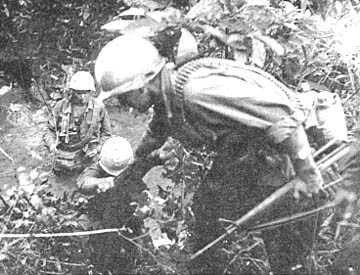 Probing carefully, the Columbus, Ohio, soldier found a wire running off to the right and into the brush. As he reached for it, the wire went taught. Apparently another trooper had become entangled in the brush and had the trip wire wrapped around his ankle. Skeens found himself staring at the mine knowing it was too late to call out. Instead of an explosion however, there was a loud "pop" ... the mine was a dud. Skeens now has a good luck charm hanging around his neck - a rusty safety pin from a mine. DAU TIENG - The men of the 3rd Bde, 25th Div, have discovered a new taste treat, from C-rations "pizza." CPT Samuel R. Noto, an Italian-American from Scranton, Pa., learned the recipe from a helicopter pilot during one of the search and destroy operations of the 2nd Bn, (Mech), 22nd Inf. Since then "Noto's Pizzeria's has been going full blast. The recipe requires one can of spiced beef, one C-ration bread roll, one can of cheese . . and hot sauce, if available. You open the beef and bread cans, leaving the tops attached, add the hot sauce to the beef, and then empty the contents. Cut the bread into four equal slices and put one slice each into the beef and bread cans. Then spread half the beef on both slices. Put the other two slices of bread on top and add the remaining beef. This should make a double layer of bread and beef in each can. Then top off each pizza with half a can of cheese. To heat, you first close the lids on the cans, and then put them into a C-ration box. Close the box and light with a match. When the box has burned out, presto!, the pizza is ready. This novel way of heating the pizza works every time. As Noto remarked, "Momma Leonies it isn't," but it is a new way for foxhole chefs to change their C's into a gastronomic treat fit for the most discriminating gourmet "grunt." DAU TIENG - When SGT Michael E. Gorman, the S-1 sergeant of the 3rd Bde, 25th Inf Div, returns from his R&R in Bangkok, he will notice a new addition to the decor of his sleeping quarters. The additional ventilation is in the form of a four-foot square hole in the tin roof which was caused by an exploding 82mm mortar round - one of 140 mortars lobbed into the base camp recently. The hole is directly above the New York City native's bunk and the blanket covering his bed is riddled with shrapnel. Gorman may think that he is having a great time in Bangkok, but he won't realize until he returns to Dau Tieng how great a time he really had. 'TIS TRUE . . . and 'is name is Fyvie ... William Dean Fyvie! The 20 year-old SP4 is a medic with the 554th Engr Bn (Const) at Cu Chi, but on his off-duty hours, he slips into his Scottish regalia and far off into the night float the melodious sounds of his bagpipes as he plays old Scottish tunes. The Newberry, Mich., soldier comes from a long line of Scotsmen, originating with the Gordon Clan, early in the 14th century. "My ancestors still live in the Fyvie Castle near Aberdeen, Scotland," says Fyvie. 1ST BDE - "IMPACT" is what they call the Improvement Action Team, and an impact is what the 1st Bde's three-man force is making on the RF-PF outpost around Tay Ninh. 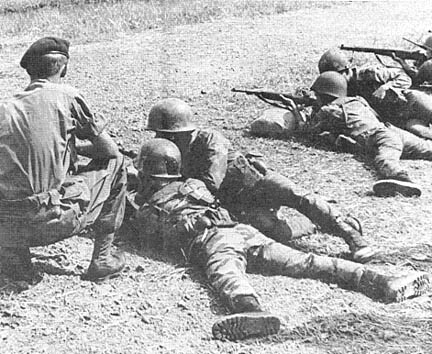 Part of the 25th Div's ARVN and RF-PF Effectiveness Program, the brigade's IMPACT section was created in November 1967. A senior lieutenant with line experience was selected from one of the battalions, a veteran NCO from another and a radio telephone operator-driver from the third. These men are the nucleus of the highly flexible team. Other specialists engineers, medics, etc., can be added as the situation demands. "We've been organized to assist the RF-PF posts with the basics," explains team leader 2LT Steven Chung of Honolulu, Hawaii. "First we help them improve their fortifications, then we teach them squad tactics, how to conduct an ambush, place mines, lay wire - the fundamentals that'll keep them alive out there. Later we plan to hold MEDCAPs at some outposts." The outpost concept was originally French and was adopted by the South Vietnamese with some modifications. The posts are manned 24 hours a day by anywhere from a squad to a platoon of RF-PF troops and are usually located near a hamlet or strategic site. Working in close proximity to the people in the hamlets, the RF-PF soldiers are a vital link in the government's security network. But the republic has had some difficulty in providing training and equipment for these forces. As a result, GEN Westmoreland has stated that the U.S. will make a vigorous effort to assist in this area. "We're not trying to bypass the South Vietnamese government," Chung cautions. "What we want is to give assistance in areas where the government lacks the ready resources to do quickly what needs to be done. As in the past, we'll continue to work closely with officials of the republic right down to the hamlet chief." The four or five days that the team spends at each outpost generally is just enough time to get things off the ground - that's the way it has been planned. IMPACT's object is not to have Americans direct a project to completion. 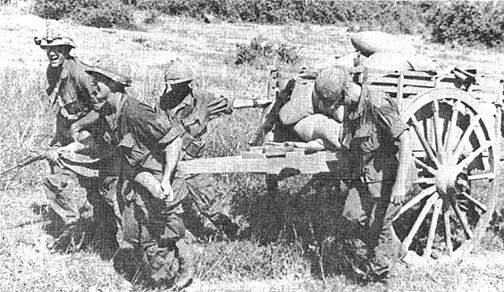 Rather the team shows the Vietnamese how to shore up their weak spots, then leaves to repeat the process in another post, while the soldiers gain confidence in their own abilities by doing it themselves. "Once we've produced the goods and some guidance, Vietnamese initiative and ingenuity usualy carries on after we're gone," Chung commented. "We've gone back to an outpost to see how things are progressing and found the people of the hamlet working alongside the soldiers to build the place up. They're glad to pitch in because they realize it's in their best interest to have the strongest possible protection. Cooperation like that makes working with this team extremely rewarding." 2ND BDE - First it was an eagle flight, then a combat assault, but when the tunnel-trapped bat ambushed the tunnel rat, it was really too much. PVT Victor N. Acevedo of New York City, a member of the 25th Inf Div's 2nd Bn, 27th Inf "Wolfhounds," volunteered to explore a tunnel complex Delta Co had uncovered during Operation Atlanta in the Iron Triangle. About five meters inside the tunnel, a bat suddenly swooped by the startled soldier. "It really made me jump," said Acevedo, "I took a swipe at him with my flashlight." The bat withdrew. Acevedo continued for another 50 meters, when the bat staged a second assault on the still-startled 2nd Bde soldier. "By then I was getting annoyed, so I threw my knife at him." Unfortunately, he missed, but the bat beat a strategic withdrawal. Acevedo pushed on for another 60 meters. The bat, clinging to the wall, lurked in ambush. When Acevedo crawled by, he attacked, only to meet with a fierce hand-to-wing bayonet counteroffensive. "I never did get him," lamented Acevedo, "and I lost my knife in the scuffle. It was really too much." 2ND BDE - A 25th Div soldier stalking Viet Cong through the rice paddies of Hau Nghia Province found himself locked in battle with two angry water buffaloes instead. SP4 Kenneth R. Hardy of Whittier, Calif., a member of the 2nd Bn, 27th Inf "Wolfhounds," had been moving with his company in search of a Viet Cong squad spotted from the air. As he crossed a large paddy, the 2nd Bde soldier noticed two nervous water buffaloes heading his way. "They seemed to be drawing a bead on me," Hardy recalled. "I was wondering what they were going to do, when one of them charged." A bit of quick footwork got him out of the way of the first, but what he failed to notice was that the second beast was in hot pursuit. The buffalo hit the Wolfhound in the legs, throwing him five feet up and fifteen feet back. The animal broke off the attack, so Hardy limped along with the company for another mile, when the unit engaged in a brief firefight which netted one enemy killed. 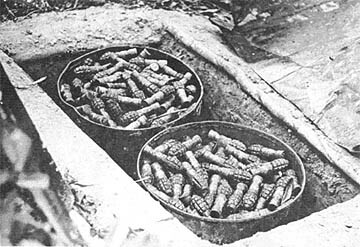 DAU TIENG - Three caches containing an estimated total of 15,000 Viet Cong hand grenades were recently discovered by troops of the 3rd Bde, 25th Div, during Operation Yellowstone. As B Co, 3rd Bn, 22nd Inf, was moving through dense jungle west of Dau Tieng, PFC Robert L. Merton, point man from Rocky Mount, N.C., uncovered the first two caches, each of which consisted of two 50 gallon oil drums full of small grenades. The drums had been sunken into holes and covered with metal roofing material. "The fact that we received sniper fire just before finding the grenades seems to indicate that the caches were fairly new and closely guarded," explained 2LT Arthur P. Gormley, the lead platoon leader from Brooklyn, N.Y.
After the troops had swept through the area, the grenades were destroyed. We are able to write because our class won five dollars for selling the most tickets to a school activity. The class voted to use the money to cover postage on letters to the men in Vietnam. Our names are Cindy Jones and Marianne Ellington. We are writing to tell you how proud we are of you and what a fine job we think you are doing. We apprecaite you men and admire you greatly for your courage and for what you are doing for them. Remember! Everyone is praying for you and we wish you the best of luck.